Why do so many women go on volunteer vacations? London, England (CNN) -- When 23-year-old Danielle Miller packed her bags for a holiday in Cape Town, South Africa, sun and sand were the last things on her mind. Instead of working on her tan in the country's most popular tourist destination, the diplomacy student from the University of Kentucky, United States, spent two months as a teacher's assistant in the apartheid-government-built township of Manenberg. But far from being the odd one out, Miller is part of a growing number of women replacing their holidays with volunteer work, often in remote and far-flung regions of the world. Roughly 70 percent of all volunteer travelers are women, according to tour operators and industry experts. It's a huge gender gap in the travel sector, which, apart from business travel, is seen as relatively gender neutral. Alexia Nestora, former director of volunteer travel organization i-to-i North America and founder of the blog, Voluntourism Gal, says there is no doubt the majority of voluntourists are women. Have you been on a volunteer vacation? Share your photos and video on iReport and you could be featured on CNN. As a volunteer you're allowed access to places and experiences you never would as a tourist. She told CNN: "Definitely in the last three years there has been an increase in women, especially over 50. "Now tourism companies are catering for an older niche and they seem to be mostly women, a large number either divorced, widowed or retired and looking to start something new." Nestoria believes one of the reasons for the gender divide is that voluntourism caters more to women's hopes and wants. She said: "Women really want to connect to people and relate to different cultures when they travel, they don't want a fly-by experience. Voluntourism gives them this." This was certainly true for 52-year-old administrator Caroline Bedford from Northamptonshire, England. In November 2008, Bedford traveled to Nepal and spent a month working at Kathmandu's Naxal orphanage. "It's an incredibly fulfilling experience," Bedford told CNN. "There's an emotional involvement and connection that you will never have when you take a regular holiday. I still get emails from people in Nepal giving me updates, I still feel deeply emotionally attached," she said. But apart from altruistic motives, some academics say there is evidence women sign up for more self-serving reasons, often as a way of offsetting "guilt." "These holidays offer women a sense of empowerment and a sense of freedom," Professor Annette Pritchard, Director of the Welsh Center for Tourism Research and author of "Tourism and Gender" told CNN. "It's a liberation from the day-to-day routines, but more importantly it's a guilt free way of enjoying the time off," she said. Nancy McGehee, Associate Professor in Tourism at Virginia Tech university in the United States, agrees. Her studies of voluntourists show that guilt is a major factor for women when choosing how to holiday. She said to CNN: "Women are less likely to 'gift' themselves a trip or holiday than men. In some ways, voluntourism is a way of enjoying your break without feeling selfish." But guilt aside, there are practical reasons why such a large number of women choose voluntourism, namely safety. 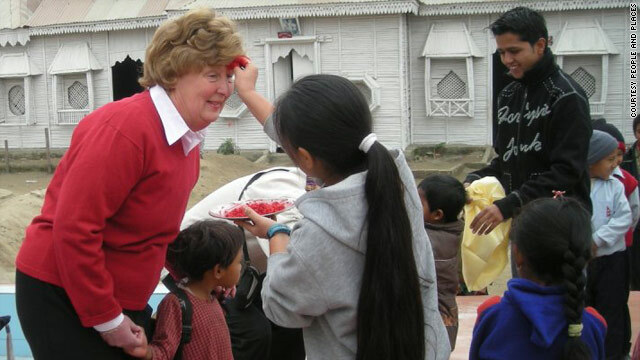 "Voluntourism is a safe way for women travelers to culturally immerse themselves and experience a new place," McGehee said. "There is a sense of camaraderie with both their fellow travelers and with the local people they are working with," she added. This point rings true for a lot of female voluntourists, including Miller, whose neighborhood in Cape Town was far from safe for a young woman traveling alone. She said: "If I had the choice between backpacking or volunteering for a month I'd choose the latter. Volunteering I was in a group and a community and I felt safe. "As a volunteer you're allowed access to places and experiences you never would as a tourist. People can be very on guard around tourists, but people in South Africa called me sister, they were like my family," she continued. For men, far from being less caring, the lack of numbers in volunteering could be down to a lack of confidence in their caring skills. This is something Sallie Grayson, program director at the volunteer holiday company People and Places, has come across. She told CNN: "We can't point to one thing and say that's why men don't participate as much, but one reason seems to be that men aren't as clear as women about what skills they have to offer. "We have men applying to work in business projects but they rule themselves out of working with children or in healthcare because they don't think they can," she explained. But the numbers are shifting. Already People and Places has seen a two percentage point increase in the number of its male volunteers for the next six months. That's something Grayson says is down to more information getting out there and women making their partners come along on trips. "The involvement of men is growing, we don't think it will ever be equal, but it's getting bigger," she said. "We need more male volunteers; they can make a huge difference."